Complete package including 3D glasses and award winning, market leading 3D content and software for an easy access to an amazing 3D experience. 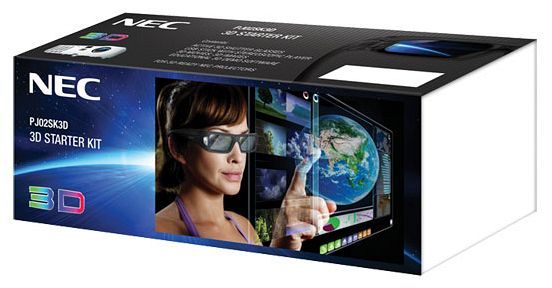 The new 3D StarterKit contains NEC’s new 3D glasses and market-leading 3D content and software in one handy kit to provide easy access for example for schools looking to introduce the 3D experience into the classroom. The 3D content includes seven interactive applications and numerous interactive 3D modules including the exploration of the human heart and of a plant cell. Eight 3D demo videos include illustrative examples covering subjects such as geography, sciences and technology, as well as primary educational content for teaching spelling and mathematics. A full version of the Stereoscopic Player allows to play any kind of 3D videos and images.